Hurry in for great value on a runout Subaru Forester, including $500 worth of Genuine Subaru Accessories. 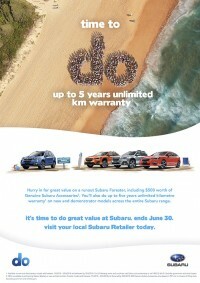 You’ll also do up to five years unlimited kilometre warranty on new and demonstrator models across the entire Subaru range. It’s time to do great value at Subaru. Ends June 30. Visit your local Subaru Retailer today.